December 6 marks the anniversary of the Babri masjid demolition ! 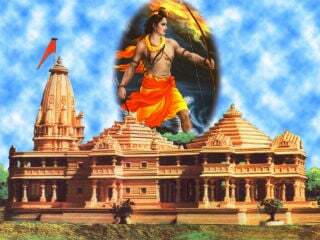 Babur, the Mughal muslim invader, destroyed the Shriram temple in Ayodhya and built a mosque on top of the rubble. On December 6, 1992 the simmering sentiments of centuries came to a boil and two and a half lakh Hindus who had gathered in Ayodhya razed the Babri masjid and soothed the centuries old wounds. 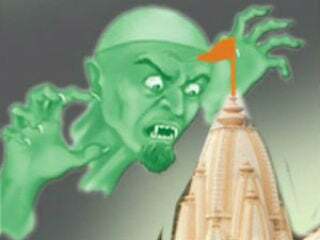 With lakhs of temples destroyed how many black days should Hindus observe ? Pseudo secular intellectuals and religious fanatics observe a Black Day on December 6th because one Babri masjid was razed. The Muslim invaders like Mughals have destroyed and desecrated lakhs of temples. If Hindus were to observe a black day for each such incident, then 365 days would fall short. After 77 attempts, possession of Ram Janmabhoomi still a dream ! Jahir-ud-din Babur had the temple dedicated to maryada purushottam Shriram destroyed, and a mosque built in its place. History has a kept faithful record of the intolerance of these invaders; we have reproduced some of these records here. 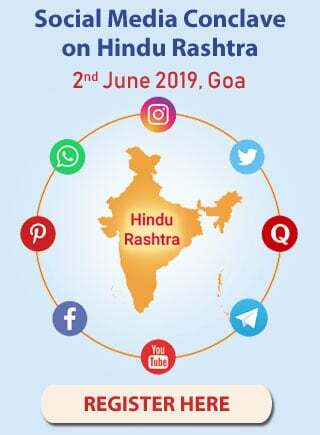 It is a matter of grave concern that after centuries of being in possession of the truth of Shriram janmabhumi, Hindus still await its liberation. 1. Babur’s shahi firman to destroy the temple at Shriram janmabhumi ! ‘By the order of the Shahenshah-e-Hind, Malikul jahan, badshah Babur and hazrat Jalalshah, permission is hereby granted to destroy Rama’s birthplace in Ayodhya and replace it with a mosque built with the recovered materials. You are hereby ordered to ensure that no Hindu from other parts of Hindusthan be allowed into Ayodhya. If any Hindu should find himself in Ayodhya and you have cause to doubt his intentions then you will be duty bound to capture and execute such Hindus’. 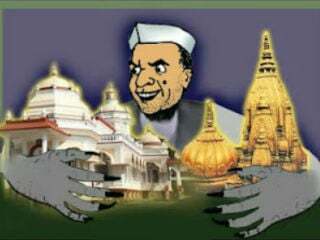 It is clear that the Mughals knew that destroying the Shriram janmabhumi temple and erecting a mosque in its place would be no walk in the park. Hence the specific orders to kill any Hindu who was suspected to be travelling to Ayodhya. 2. Mir Banki goes on a rampage in Ayodhya ! Sir Alexander Cunningham, in the Lucknow Gazetteer speaks about the carnage that Mir Banki, a governor under Babur, unleashed on Ayodhya. Over 1.74 lakh Hindus who had gathered to protect the Shriram temple site were ruthlessly slaughtered; their bodies piled high and wide. Mir Banki’s canons fired into the temple and reduced it to rubble. 3. It is Hindu blood that has coloured the stones of the mosque ! Hamilton writes in the Barabanki Gazetteer ‘Jalalshah used stones from Lahore coloured with the blood of Hindus in the construction of the mosque. Kajal Abbas Musa Ashikan Kalandarsahib a zealous Muslim fakir was the ‘inspiration’ for the destruction of the temple and the construction of a grand mosque in its place. He had plans to turn Ayodhya into a Mecca of the east. In his memoirs, Babur recounts the destruction of the Ram Mandir (in Ayodhya) on the orders of Abbas Musa Ashikan Kalandar and how the materials from the temple were reused to build a mosque in its place. 5. 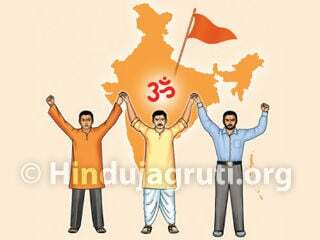 Kshatriya Hindus of Ayodhya continue to fight for Ram Janmabhoomi ! The wanton death and destruction in Ayodhya did not deter the Hindus from their fight to reclaim Ram Janmabhoomi, it continued even into Humayun’s (Babur’s heir) reign. 10,000 suryavamshi Kshatriya warriors of Sirsinda and Rajepur near Ayodhya, geared up to fight for Ram Janmabhoomi. They destroyed all Mughal structures surrounding the tempe area. They even managed to destroy the entrance to the Babri masjid. Three days after this started, the Mughal army engaged the kshatriya warriors and killed them. The Mughal army also had their revenge by destroying and burning down the villages from which the warriors hailed. 6. Hindu efforts to build a temple under Akbar’s rule ! After the massacre during Humayun’s rule, it took some years before the Hindus could regroup and try to reclaim the Ram Janmabhoomi. Under Akbar’s (Humayun’s heir) rule another battle for Ayodhya ensued. This time however, the Mughals were not taken by surprise and the Hindus faced a strong resistance. The Hindu warriors persevered and managed to erect a platform to build a temple on, right in front of the mosque. . Raja Birbal and Raja Todarmal prevailed on Akbar to allow the platform to stand. Akbar then consented to a small temple housing a Shriram murti (idol) on the same platform. The ain-i-akbari (the chronicles of Akbar’s reign) documents this in the following words.. This order was followed by Akbar’sson Nuruddin Jahangir and grandson Shahbuddin Shahjahan, who allowed the daily worship to take occur sans interference. 7. Aurangzeb’s evil designs on Ram Janmabhoomi ! Shahjahan’s son Muhi-ud-din Aurangzeb Alamgir was a tyrant and a bane to Hindus. History cannot gloss over the numerous accounts of his Hindu hatred having manifested. One of the earliest such incidents was when having wrested the throne from Shahjahan, Aurangzeb turned his attention to Ayodhya. He sent his general Jabaz Khan on a campaign to Ayodhya. The Hindus of Ayodhya got wind of the impending attack and ferried the idol of Shriram and all the temple articles to safety. The surrounding villages, which had been warned of the attack, gathered a formidable Hindu force to protect the temple. 8. Tong-wielding sadhus to the rescue ! Vaishnavdas (a disciple of Samarth Ramdas Swami) used to live in the Parashuram monastery on the Ahalya ghat in Ayodhya. He had the support of 10,000 tong-wielding sadhus. When they learned of the attack by Jabaz Khan’s attack on Ram Janmabhoomi, they rushed to join and fight alongside the Hindus. For seven days the Hindus and the Mughal forces clashed at Urvashikund. At the end of a fierce battle the Mughal forces took their heels. 9. Hindu and Sikh warriors unite to rout the Mughals ! The news of the royal army’s defeat in the hands of sadhus spread. A livid Aurangzeb had Jabaz Khan’s command removed. With an intense desire to crush the Hindus guarding Ayodhya, he sent a 50,000 strong force under the command of Sayyid Hasan Ali to Ayodhya. The sadhus guarding Ayodhya were also on alert. Vaishnavdas sent word to Guru Gobind Singh seeking His help in guarding Ayodhya. Guru Gobind Singh obliged and led a huge force of Sikh warriors to Brahmakund. Under the able command of Guru Gobind Singh, the united force of Hindus and Sikhs routed the Mughal army. Hasan Ali did not live to face Aurangzeb to tell him about the defeat. It would be four more years before Aurangzeb tried to attack Ayodhya again. 10. Aurangzeb gets control of Ayodhya ! Four years of peace had lulled the Hindus of Ayodhya into a false sense of security. In 1664 Aurangzeb attacked Ayodhya again and slaughtered 10000 Hindus. Their bodies were dumped into a well (भागात स्थित असलेल्या नवकोणातील कर्न्दप विहीरी) to the west of the temple and walled in. The well has stood the sands of time to tell the story of the cruelty of Aurangzeb and the Mughals. Today the Muslims claim ownership of the well too. It was after this war that the royal army destroyed the platform on which the Ram Mandir was built and fortified the area (याच युद्धानंतर शाही सेनेने रामजन्मभूमीचा कट्टा खोदून त्याला गडाचे रूप दिले.). Now each year, on Ramanavami, the Hindus offer flowers and other offerings to this destroyed platform. 11.Hindu struggle to liberate Ram Janmabhoomi ! A. After Aurangzeb, Lukhnow came under the rule of the Nawabs. The Hindus tried to reclaim Ram Janmabhoomi by force during the rule of Nawab Sahadat Ali. Unfortunately they failed. B. The Hindus tried again to wrest control of Ram Janmabhoomi during the rule of Nawab Nasiruddin Haider. Many Hindu kings joined forces and the battle raged for 8 long days. The Nawab’s army reached Hanumangadh. There, the Hindu forces received help from the tong-wielding sadhus. Together they managed to make the nawab’s army flee and took control of Ram Janmabhoomi. This victory was short-lived though, the Nawab’s forces recaptured Ram Janmabhoomi in few days. 12. Efforts by Hindu kings ! Hindu efforts to regain Ayodhya continued into the reign of Nawab Wajid Ali Shah. Almost every Hindu king of Awadh, barring a couple, participated in this struggle. Cunningham’s brief account regarding this was published in a book from the Faizabad Literary collection. He says that the Nawab’s (mostly English) army stood by watching the Hindus and the Muslims fight amongst themselves to control Ayodhya. The battle raged for two days. Houses, crypts and mosques were destroyed, even livestock was not spared. Blinded by rage as they may have been, the Hindus did not cross certain lines; they did not attack or molest the Muslim women and children. The Muslims began to flee Ayodhya. Worried that the situation may go out of control, the Nawab’s army imposed travel restrictions in Ayodhya. Maharaja Mansingh conferred with the Nawab and directed the Hindus to rebuild a platform in Ayodhya and install the idol of Shriram there. A makeshift temple was also erected. 13. British rule, and the struggle for Ram Janmabhoomi ! A. Even while the country was under British rule, the hindus did not forgo their desire to see a Temple in Ram Janmabhoomi. Attempts to make over the temple land in 1912 were thwarted by the Biritish though. inflict significant damage to the Masjid. However, a British officer (उपायुक्) J P Nicholson, had the damage rectified and the masjid rebuilt. A small plaque in a part of the masjid reads ‘Tahawwar Khan rebuilt the mosque destroyed by the Hindus on 27.3.1934 (1352 Hijri)’. 6 December, 1992, is a date that many people are familiar with. But few people know that prior to this day, there have been 77 attempts to regain control of Ram Janmabhoomi. With 4 attempts during the time of Babur, 10 during Humayun’s rule, 30 when Aurangzeb was on the throne, 5 when Shahadat Ali was the ruler, 3 during the time of Nasir-ud-din Haider, 2 during British rule and once post independence, during the tenure of Shri P V Narasimha Rao; the struggle for Ram Janmabhoomi has been a long and arduous journey. A sense of fulfilment can only be achieved when we stop idolising invaders and try and rebuild our forgotten heritage. Rajdharma (the code of conduct for a ruler) dictates that it is the duty of the King to look after the welfare of the subjects and provide relief when they are distressed. So if a thief targets the citizens, it is the ruler’s duty to have the thief apprehended and punished. Only with stringent and appropriate punishment can justice be delivered and order restored. 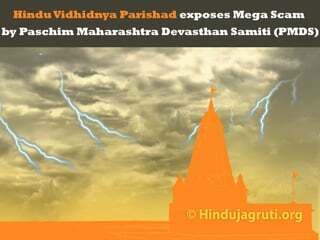 Unite against mega scam by Paschim Maharashtra Devasthan Samiti ! Unite to liberate Bhojshala (Saraswati Temple) to regain Hindu Rights !